Follow me as we discover how to complete a New York to Orlando no fly vacation. Like millions of others, your search has brought you to this website for answers. You want to get to the land of magic - Disney World - or some other hot vacation spot in the Orlando, but you do not want to board an airplane. 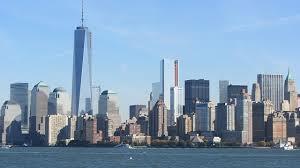 We are happy to help you get from the Big Apple to the hottest vacation spot in the United States. Every year, millions of people load up cars, catch a bus, board an airplane and head to Central Florida, the home of Walt Disney World. 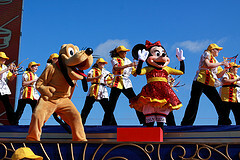 While most people visit this area for the Disney attractions - The Magic Kingdom, Epcot Center, Hollywood Studios and Animal Kingdom - Orlando is home to many other attractions. There is Universal Studios, Wet 'n Wild, Legoland, The Holy Land Experience, SeaWorld, and a short ride away is Busch Gardens in Tampa. For some people, combining a short cruise out of Port Canaveral (about fifty miles east of Orlando) with an theme park visit makes for the perfect vacation. It is quite understandable why so many run to this area annually. But what about those New Yorkers and others in the northeast who hate flying or simply do not want to board an airplane, but still want to visit Disney World or some other attraction? How do they complete a New York to Orlando no fly vacation? Your first no-flying vacation option from New York to Orlando is to drive. 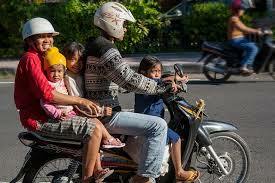 Note: You may not want to use a motorbike, as shown above, but you can certainly use the family car. Ensure that it is a reliable machine, because you have quite a distance to cover. The distance from New York to Orlando is about 1,100 miles, driving along I-95 South. Friend, that's about a fifteen to sixteen hour trip. If you think about the time, it will seem rather daunting. Consider the drive a part of the vacation adventure. Plan to stop overnight at a hotel (in Virginia or North Carolina) along the way, so that the children will not become too miserable. 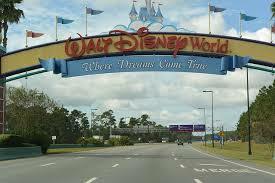 Your second option for a New York to Orlando no fly vacation is by bus. With the bus, you do not need to worry about the exhaustive driving and stopping overnight at a hotel. 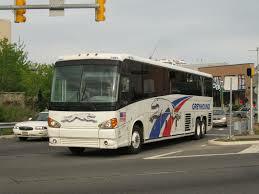 While there are several interstate bus services now available in the United States, we will focus on Greyhound. Your main bus terminal for Greyhound in New York City is the Port Authority station at 42nd Street and Eighth Avenue. Port Authority - 625 8th Ave - New York, NY 10018. You may also visit the Port Authority's information page by clicking here. Note: When riding Greyhound, expect a variety of passengers. The ride is fine and the fares are reasonable, but the overall experience can be sometimes disheartening. Also, to get to and from the bus station you will need to take a taxi. For a better ride, you may consider the next New York to Orlando no-fly vacation option. For those looking for a smoother and more comfortable ride from New York to Orlando, the train is your answer. 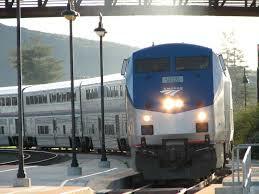 Amtrak will get you from the New York Penn Station to near the Orlando International Airport. From there, you can take a taxi to your hotel. For more information on this station, click here. For information on this address, click here. 1. Your best option is by car - yours or a rental. 2. If you travel by public transportation, you will need to take a taxi to complete your trip. 3. 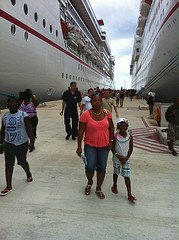 Work with a Travel Agent to get you a hotel near to your areas of interest, and one with shuttle service. 4. If your hotel or resort does not have shuttle service, you will need to rent a car in Orlando to get around. The bottom-line is that you can accomplish a New York to Orlando no fly vacation, but this is one that needs extensive planning especially if you are using Greyhound or Amtrak services. Take the family and go have fun!